You don't swing too quick! So you think you swing too quickly. If there’s one thing that you must learn to do if you want to play better golf it’s not emotionally evaluating your shots. In other words, don’t make up reasons why you played a poor shot. Let it go and step up to the next shot with a clear head. Adult temptation is to think, analyse and control. I used to do the same thing but was never really able to experience my best golf. Each round was hard work – continually thinking and trying to work out what I did wrong (or right) took its toll. Best you forget about judging and evaluating your shots – hit the ball and move onto the next one. Doing so will allow you to free your mind and play your own version of remarkable golf. The “swinging too quickly” syndrome is a common one. I think it’s a bit of a cop out too. When you can’t think of anything else it’s easy to blame the errant shot on a quick swing. My advice is to stop doing it. Most golfers I know want to hit the ball further. By swinging slowly (what you do when you’re trying not to swing quickly) you don’t allow yourself to swing with speed. Speed allows you to find power, and extra power makes the game more fun. Loosen up and let your golf swing flow. Stop trying to slow your golf swing down. Commit to the shot at hand and go with your natural swing. Your instinctive swing is better than any consciously controlled swing you can come up with. Ignore advice from others. It really is impossible for them to tell you accurately if you’re swinging too fast. Learn to trust your own swing and intuition. If you hit a poor shot it’s unlikely you were swinging too quickly. Chances are it was just a bad swing – it’s not possible to hit every shot perfectly. Accept a bad shot or two and move on. You can play great golf with a quick swing – especially if swinging fast feels good to you. Conscious control and emotional evaluation will hold you back. If you’re trying to slow your swing down you’re not playing automatically. If you’re making up stories or guessing what you’re doing wrong you’ll always be disappointed. Automatic golf is the key to playing your best golf. It allows your natural instincts to take over and gives you the best swing possible. Automation will keep that adult mind out of the equation – you’ll be free to play without that inner critic holding you back. Ultimately you want to swing the club in a way that feels good to you. Stop thinking about too quick or too slow, there’s no such thing. Are you getting good results on the practice fairway? 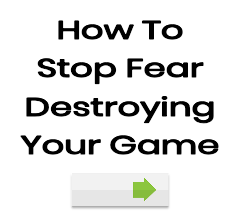 If so then you need to really focus on automating your game. It sounds easy, and it is, but it can take a while for the results to kick in. Like “swinging too quickly” I’m not sure you have identified your fault correctly. I think you have black spots in your swing – this happens when you sort of short circuit. Your brain gets overloaded with info and you have a short circuit. Happens when you are trying too hard and thinking too much about the swing. Have you attempted to swing freely on the range? And then hit the course with the same swing? I truly believe if you can think less & find your natural swing you’ll discover a better and more reliable golf game.